Federal education policy plays a critical role in promoting equal opportunities to learn. The Education Department under the Obama Administration developed regulations for implementing the Every Student Succeeds Act, or ESSA, as part of the federal rulemaking process. One of the key regulations required districts with large achievement gaps to equalize funding across schools. Inequitable funding within school districts results from something called the “comparability loophole,” where more experienced teachers, who earn higher salaries, are more likely to work in a district’s lowest-poverty schools. A new policy brief from the University of Texas-El Paso Center for Education Research and Policy Studies, where I work, finds that one in five districts nationally allocates at least 10 percent less funding to their highest-poverty schools compared to their lowest-poverty schools. About half of the school districts in Texas allocate resources inequitably across schools and 16 percent have large funding gaps (i.e., greater than 10 percent). In January 2017, U.S. Rep. Steve King introduced a bill that would effectively repeal ESSA and replace the law with a federal school voucher system. Although House Bill 610 has no chance of passing, its introduction garnered substantial public attention, despite far more consequential recent federal actions on ESSA. In March 2017, Congress employed the rarely used Congressional Review Act to block all of the regulations for implementing ESSA previously established under the Obama Administration. One week later, the Education Department released a new set of regulations that excludes the requirements that lower-performing districts take steps to address funding disparities across schools. In other words, it might be a sad day for public education, but not for the reasons many commentaries have suggested. This chart demonstrates the substantial variation in the extent to which districts allocate funding equitably across schools. Many districts across the country, including in Texas, allocate funding inequitably across schools. Figure 1 shows how teacher salary funding per student is distributed across elementary schools for districts in Texas. The y-axis shows the amount of funding allocated to a district’s highest-poverty elementary schools (measured by the number of students eligible for free or reduced price meals), while funding for a district’s lowest-poverty schools is measured on the x-axis. Each circle represents a school district, with size proportionate to enrollment. 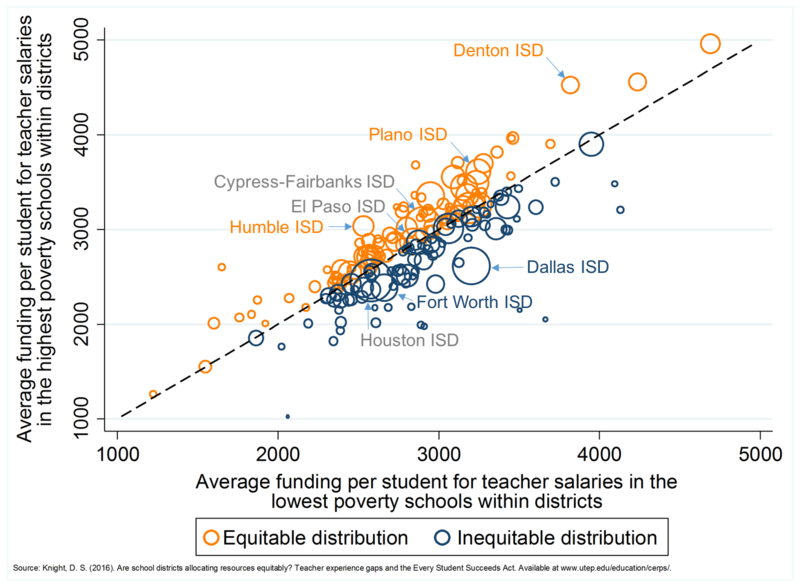 Dallas and Fort Worth have large spending disparities; Houston, Cypress-Fairbanks, and El Paso allocate roughly equal spending across high- and low-poverty schools, while Plano, Denton, and Humble have more progressive resource allocation patterns. The removal of federal education regulations under the Trump Administration places greater responsibility on state policymakers to regulate school district resource allocation. The CERPS study analyzes districts that have successfully closed resource gaps. The study highlights three potential state policy levers that may improve access to experienced and effective educators, thereby closing the comparability loophole and limiting funding disparities within school districts. First, districts that are more adequately funded relative to otherwise similar districts in the same state or county have more equitable resource allocation. This finding makes sense given prior research on this topic: Districts with adequate funding levels can target resources to their highest-poverty schools without harming more advantaged schools in their district. In contrast, underfunded districts face little incentive to allocate resources progressively across schools since doing so would harm their more advantaged schools and make it more difficult to retain teachers in those schools. 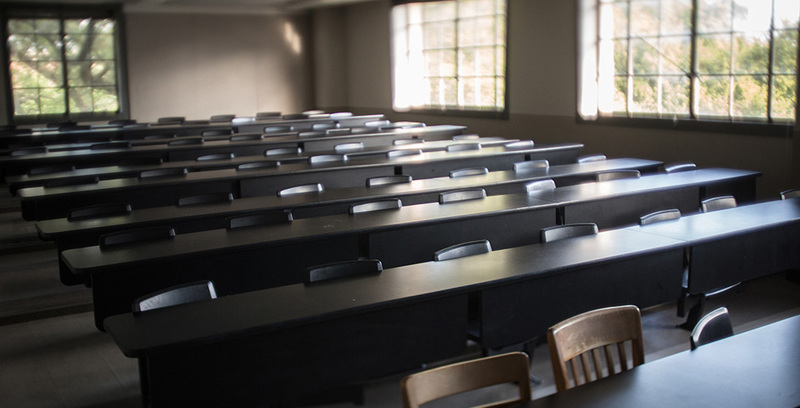 A second policy option relates to student segregation. The CERPS study shows that more segregated districts – whether by race/ethnicity or household income – have larger teacher resource gaps. Another way district leaders and state policymakers can close resource gaps within school districts is by desegregating schools. More integrated districts are less likely to have large resource gaps simply because students of various backgrounds are more evenly distributed across schools within the district. A third approach to closing teacher resource gaps would be to directly target state or federal funding to high-poverty schools. For example, the CERPS study finds that the cost to equalize per-student teacher salary spending across Title I and non-Title I schools in the same district nationally is $3.3 billion, representing a 2.2 percent increase in teacher salary spending across all U.S. schools. Texas could close the within-district funding gap by sending an additional $340 million to high-poverty, Title I schools, an increase of 3.4 percent. State policymakers are already working on policy measures that support equal educational opportunities. The Texas Education Agency has developed a plan as part of the Obama Administration’s Equitable Access to Excellent Educators program. The proposal focuses on leveraging policies already in place such as targeting teacher professional development and improving school leadership training. Yet Trump’s proposed budget removes federal funding for teacher professional development and after-school programs. In light of the removal of federal spending regulations and potential federal education spending cuts, state policies and programs are needed to reduce spending disparities across schools. CERPS research suggests the urgency for Texas legislators to provide the resources to districts that make this possible.